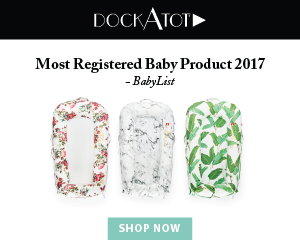 In an effort to fully disclose, this article contains affiliate links. If you purchase something, I would receive a commission. For more information, see my disclosure page. 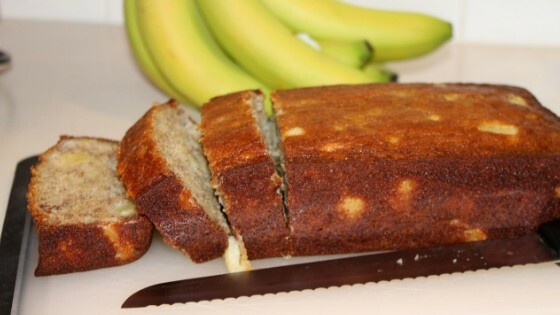 Can’t you just see yourself with a thick slice of this banana and pineapple bread? It’s perfect for a late night dessert, or a fruity breakfast meal! 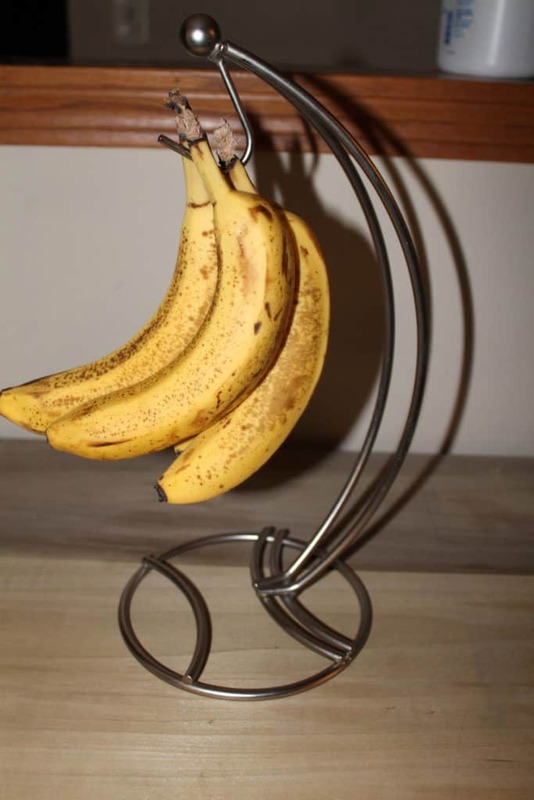 If you like my banana holder you can find it on amazon here. Before you start making the pineapple banana bread, preheat your oven to 350 degrees Fahrenheit.Then, I like to peel the bananas and put them into my mixing bowl. 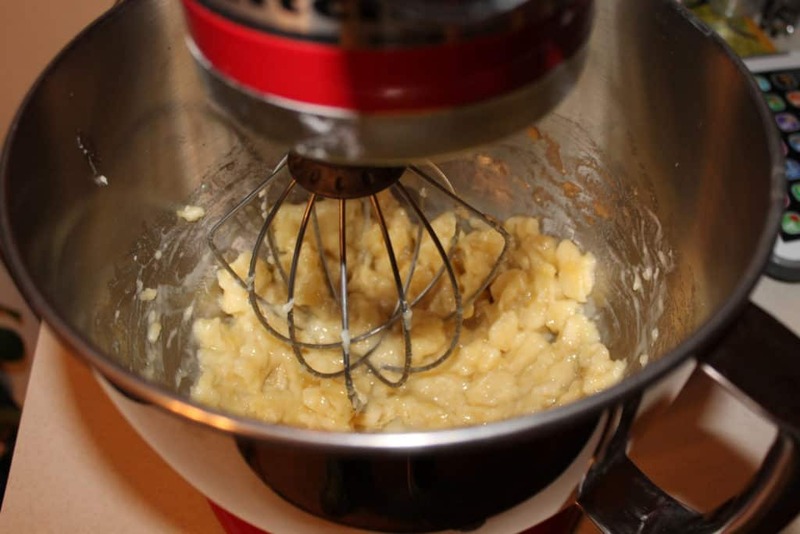 Using a whisk attachment on your Kitchenaid mixer, mash the bananas for a couple of minutes. Another tip to note: use bananas that are nice and ripe/turning brown. As they turn brown, they taste sweeter. Next, melt the butter in a microwave safe bowl just until melted. Then, pour that liquid gold into the mixing bowl with the mashed bananas! Next, you will add in both of the sugars and the eggs. Then, mix for about a minute until smooth. From their you will add the vanilla and baking soda and mix until fully incorporated. The next step to making the pineapple banana bread is to add the flour. I like to mix in 1/2 cup at a time. Make sure to scrape the edges and all around the bowl with a rubber spatula so that there is no flour left behind! After all the flour is is mixed, you will add the pineapple chunks. 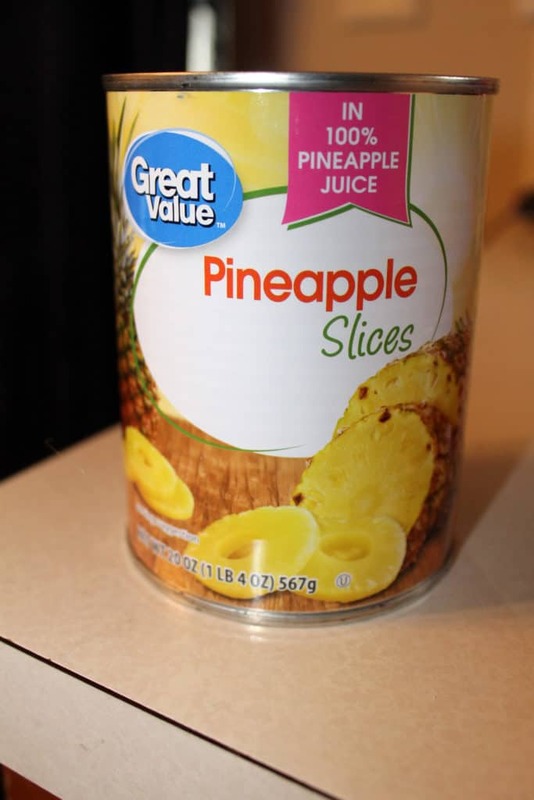 I used some canned pineapple slices and cut them into small pieces, using about half of the can. You could also use pineapple tidbits (so no cutting needed) or even some fresh pineapple for a stronger pineapple taste! One important thing to note is to drain the pineapples, as you won’t need the juice, just the pineapples. Then, you will stir the chopped pineapple into the banana bread batter with a rubber spatula. I don’t like using the whisk attachment for this because it breaks the pineapples up too much. Next, you will pour the pineapple banana bread batter into a greased loaf pan. I used the ceramic coated loaf pan that can be found here on Amazon. Then, bake the pineapple banana bread for 55-60 minutes, rotating about halfway into the cooking time. I also put a pan under the loaf pan to prevent any messes. Let the pineapple banana bread cool for at least 20 minutes. It’s easier said than done because it smells so good when you pull it out of the oven. 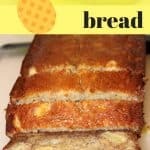 Thank you for reading my pineapple banana bread recipe! Please comment below and let me know what you think. Also, don’t forget to share and pin this recipe so you can make it too! If you enjoyed this, I have another banana bread recipe for you to try too: chocolate chip banana bread. 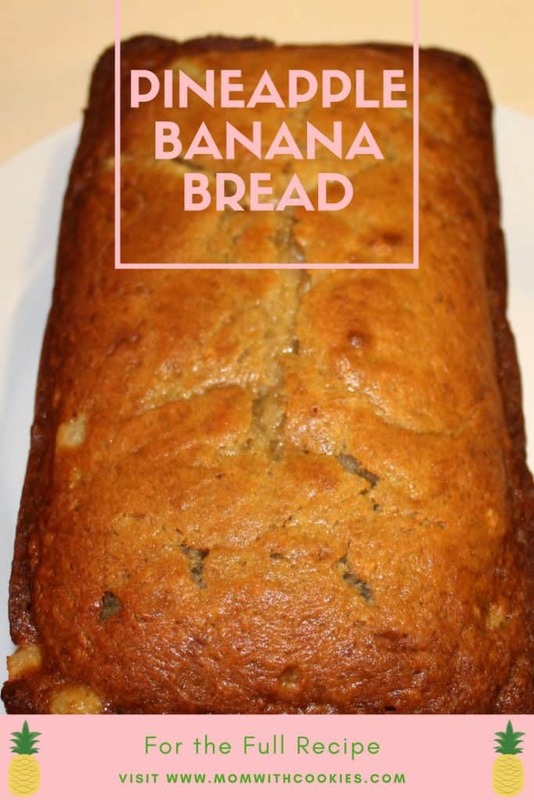 It will easily make your love of banana bread double if not quadruple in size! 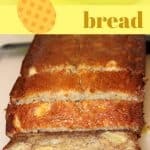 This banana and pineapple bread is the perfect snack, breakfast, or even a light dessert! It's easy to make, but oh-so-tasty. Pre-heat your oven to 350 degrees Fahrenheit. Then, peel the bananas and put them into your mixing bowl. Using the whisk attachment, run this for about a minute until the bananas are niced and mashed up. 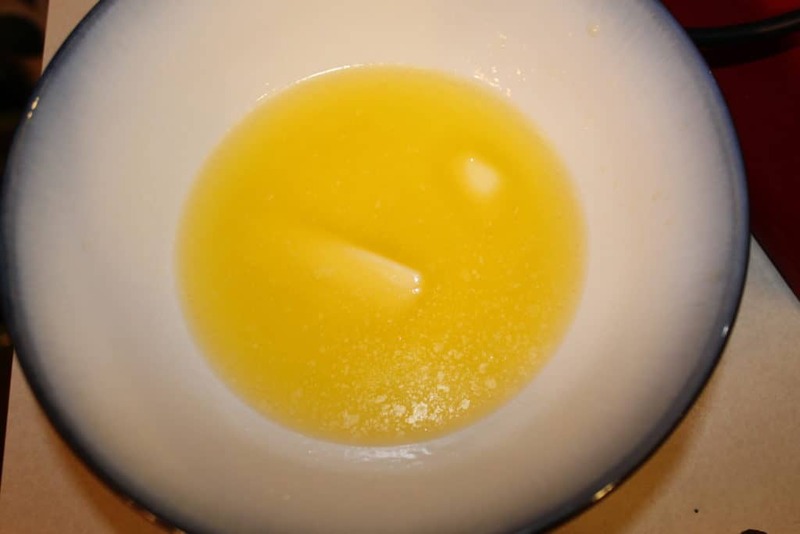 Then, place the butter in a microwave safe bowl and heat for about 10-20 seconds until melted. Add this to your mashed bananas in your mixing bowl. 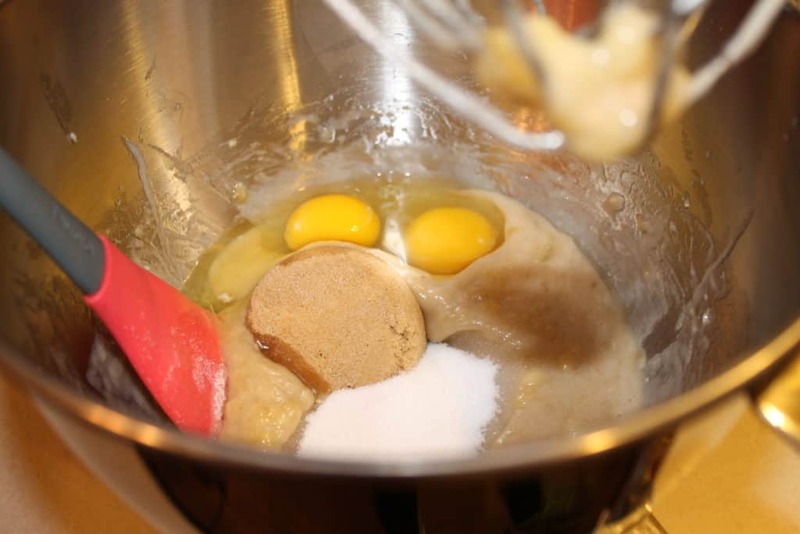 Next, add both the brown sugar, the granulated sugar, and the eggs and mix until smooth for about a minute. Add your vanilla and baking soda next and mix until fully incorporated. 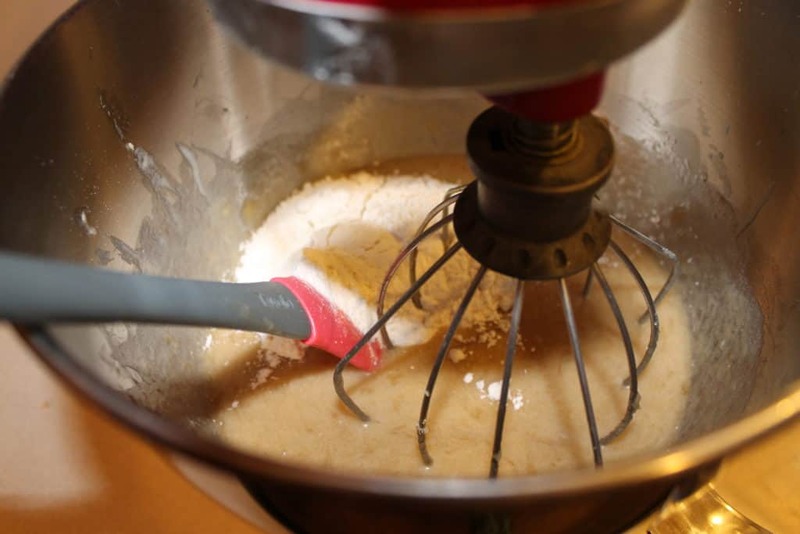 Finally, you will add the flour 1/2 cup at a time, making sure to mix well between each addition. 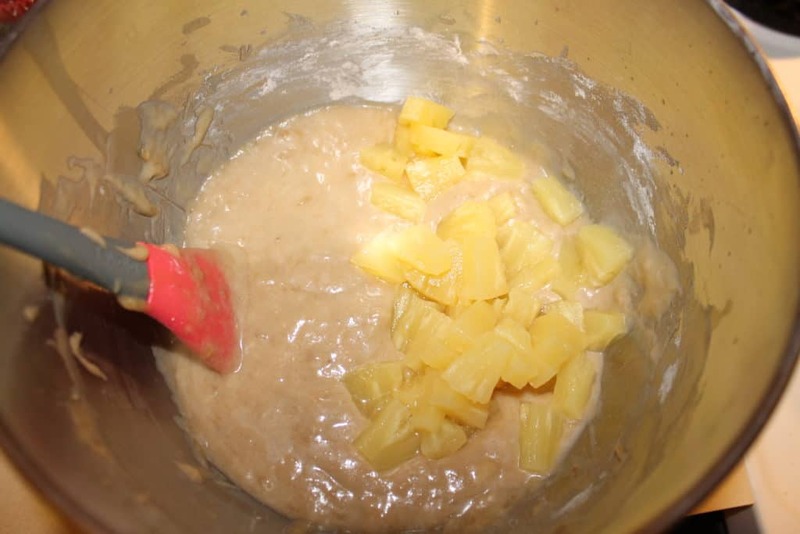 The last step is to add the drained pineapples to the batter and stir until they are evenly distributed. Pour the batter into a greased loaf pan or ceramic non-stick loaf pan and cook for 55-60 minutes. Rotate half-way through the cooking time. this would be so good with an afternoon cup of tea! i love the combination of pineapple and banana! sounds so tropical! Pineapple banana bread really is a great tropical dessert. Glad you like it Georgie! The next time I make banana bread, I am definitely adding some pineapple to it! 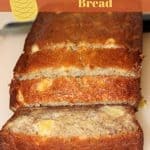 I love the idea of adding pineapple to banana bread… sounds so delicious! Have you ever also added coconut? I imagine it would be delicious. Can not wait to try this recipe! I never added Pineapple to my Banana Bread before. Next time adding it for sure. It will be perfect for my cup of coffee. You will love it Deepika! Pineapple pairs so well with banana bread. What a great idea to add pineapple! I make a lot of banana bread so I’ll have to try this. YUM! 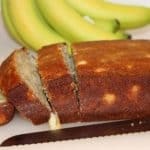 Sounds like a tasty twist on banana bread, which is always a good option with overripe bananas. Oh yes Caroline, I love making Pineapple banana bread when I have too many overripe bananas! Hi!I made this just now!I’m in south Africa! It’s cooling!can’t wait to try in the morning with my coffee.thanks for the recipe! Can you use coconut flour instead of white flour? Elsa, I have never tried it with coconut flour, but if you do try it please let me know! Just stumbled upon your recipe! Will be trying it out later today. I ran across this recipe in Pintrest, and had to let you know that I can’t wait to try it! After the recipe, you linked your chocolate chip banana recipe. This got me to wondering, why not add the chocolate chips to this recipe? I am going to try it. I do have one concern. I worry that it will be so good, that it will disappear so quickly, that I will have to make another one right away! Thanks for a great recipe! That sounds like an amazing idea Cynthia! I like the way you think. 🙂 Definitely going to try this out!! White chocolate chips might also be a delicious addition to this pineapple banana bread. This recipe looks so delicious! I am wondering if you drain the pineapple tidbits before using? Absolutely wonderful! My whole family loved it! Thanks for the recipe Joanna. I added half cup walnuts and half cup craisins. I also used a bundt cake pan. In the oven now. I can’t wait to try it. I love banana bread but have always been unhappy with how dry mine always was. This recipe is absolutely wonderful! So moist and flavorful and so easy! I make this all the time now, sometimes adding pecans or macadamia nuts. Thank you for sharing! Just made this and added coconut and pecans! It’s in the oven….I hope it turns out! Just made this as 12 muffins—used paper liners in a muffin tin and baked for about 22 minutes. Enjoyed by the whole family! Thanks so much! !